For May, the average contiguous U.S. temperature was 65.4°F, 5.2°F above the 20th century average. This surpassed the previous May record of 64.7°F set in 1934. During meteorological spring (March-May), the warm May more than balanced the cold April. The seasonally averaged temperature for the Lower 48 was 52.4°F, 1.5°F above average and ranked as the 22nd warmest spring on record. 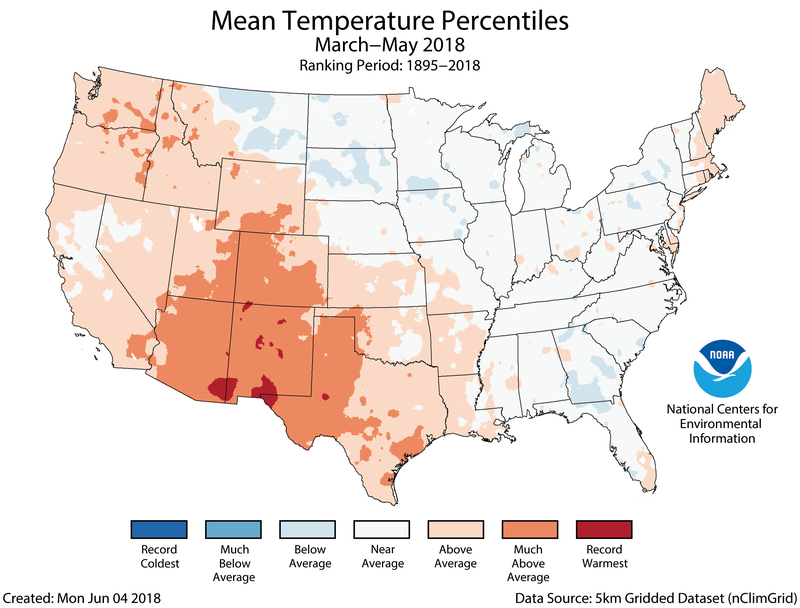 The first five months of 2018 were marked by large month-to-month swings in temperature, but when averaged, the contiguous U.S. temperature was 45.0°F, 1.6°F above the 20th century average and was the 21st warmest January-May on record. 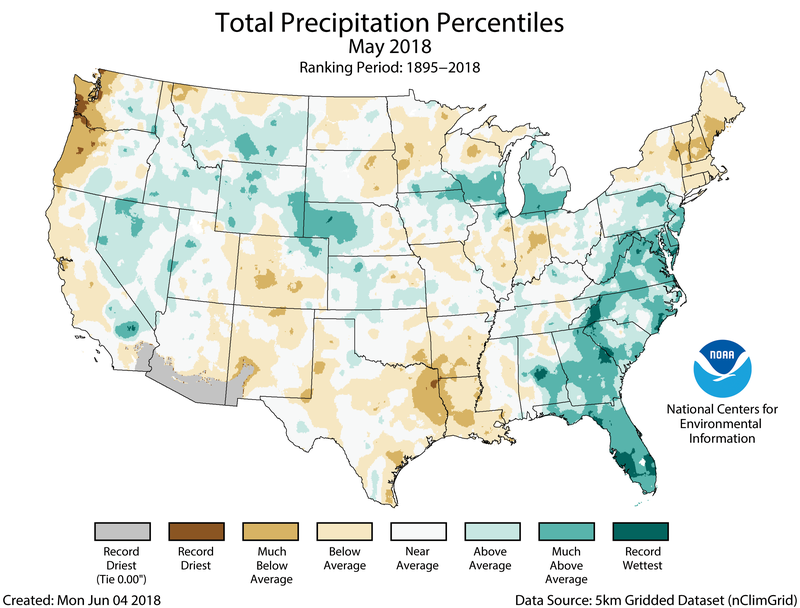 The May precipitation total for the contiguous U.S. was 2.97 inches, 0.06 inch above average, and ranked near the middle of the 124-year period of record. Subtropical storm Alberto made landfall along the Florida panhandle, bringing heavy rain to the Southeast. 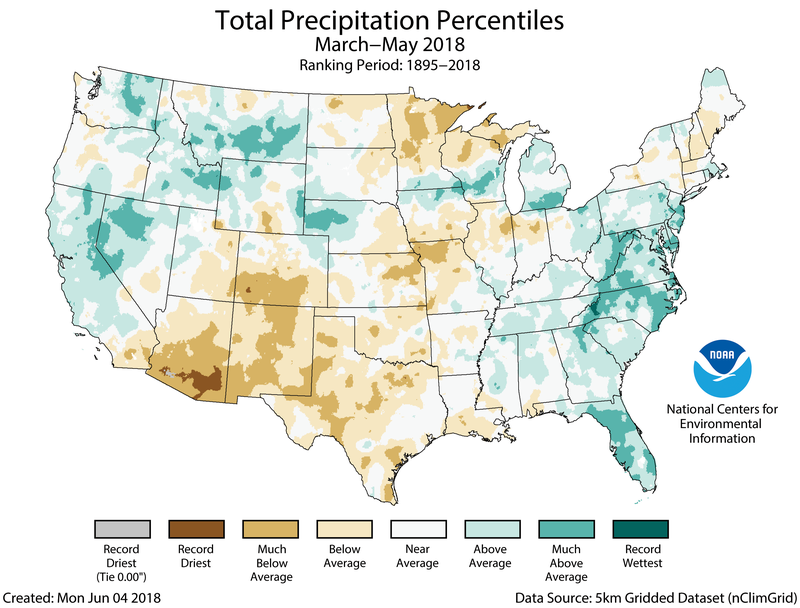 Both the spring and year-to-date precipitation totals for the contiguous U.S. were near average but masked regional extremes. The spring precipitation total was 7.91 inches, slightly below average, while the year-to-date precipitation total was 12.66 inches, 0.27 inch above average. See all May U.S. temperature and precipitation maps. Above-average May temperatures stretched from coast to coast with every state having an above-average temperature. Record warmth was observed in parts of the Northwest and stretching from the Southern Plains through the Midwest and into the Mid-Atlantic. 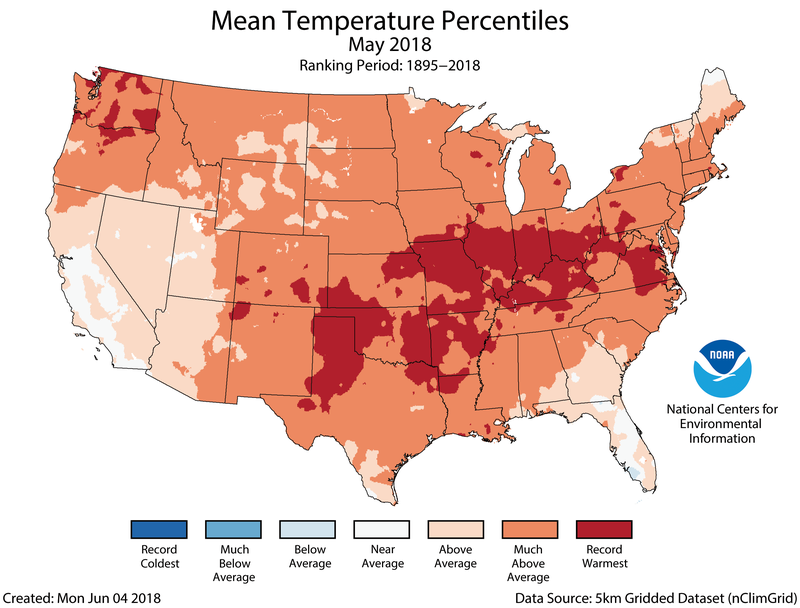 Forty-two states had monthly temperatures that were much above average with eight of those states – Arkansas, Illinois, Indiana, Kentucky, Missouri, Ohio, Oklahoma and Virginia – being record warm. The nationally averaged minimum temperature (overnight lows) was exceptionally warm during May at 52.5°F, 5.1°F above average and 2.0°F warmer than the previous record set in 1987. 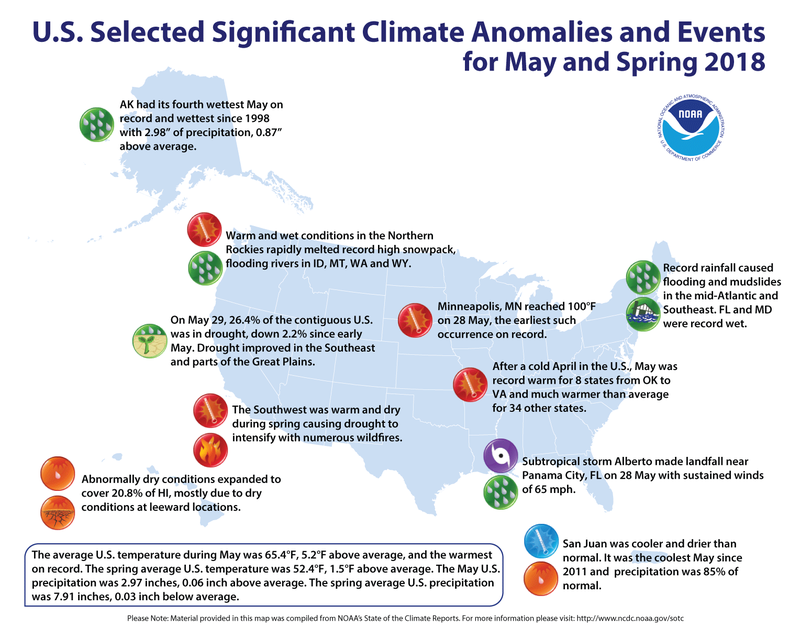 Fourteen states had a May minimum temperature that was record warm with 29 additional states having much-above-average minimum temperatures. On the daily scale, there were more than 8,590 daily warm temperature station records broken or tied during May. This was 18 times more than the approximately 460 daily cold temperature station records during the month. Several of the daily records were noteworthy, including 100°F on May 28 in Minneapolis, Minnesota – the earliest such occurrence on record. Record and near-record precipitation was observed across the Southeast and Mid-Atlantic, partially due to two slow-moving weather systems, including subtropical storm Alberto in late May. Flooding and mudslides were widespread across the region, and Florida and Maryland each had their wettest May on record. On the station level, Asheville, North Carolina, the home of NCEI headquarters, observed its wettest month of any month on record, with 14.68 inches of rain. Several other locations, including Key West, Florida, had their wettest May on record. Above-average precipitation was also observed across parts of the West, Central Plains and Midwest. Below-average precipitation was observed along the West Coast, Southwest, Southern Plains, the Northeast and parts of the Midwest. The combination of warm and dry conditions contributed to ongoing drought concerns across these regions. 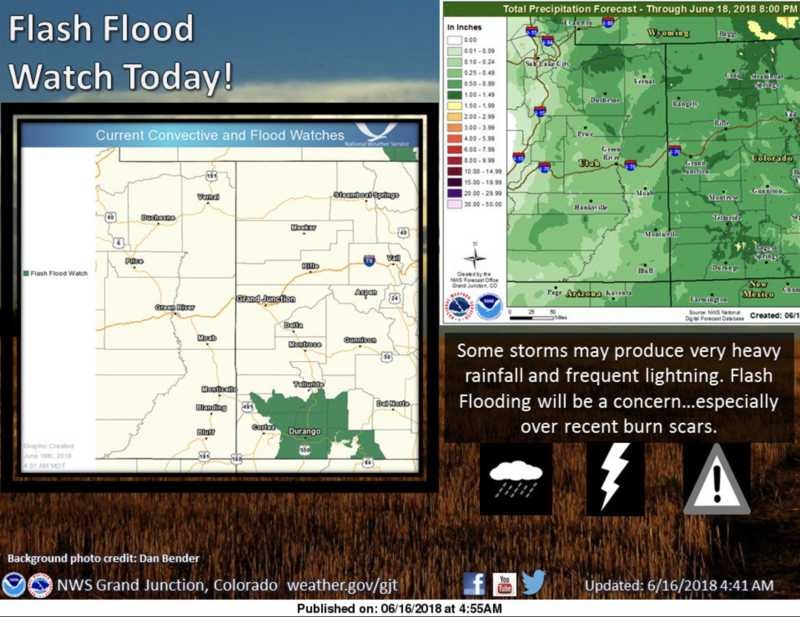 After observing record-high spring snowpack across the interior Northwest and Northern Rockies, above-average May temperatures and precipitation caused rapid snowmelt, flooding rivers across the region. 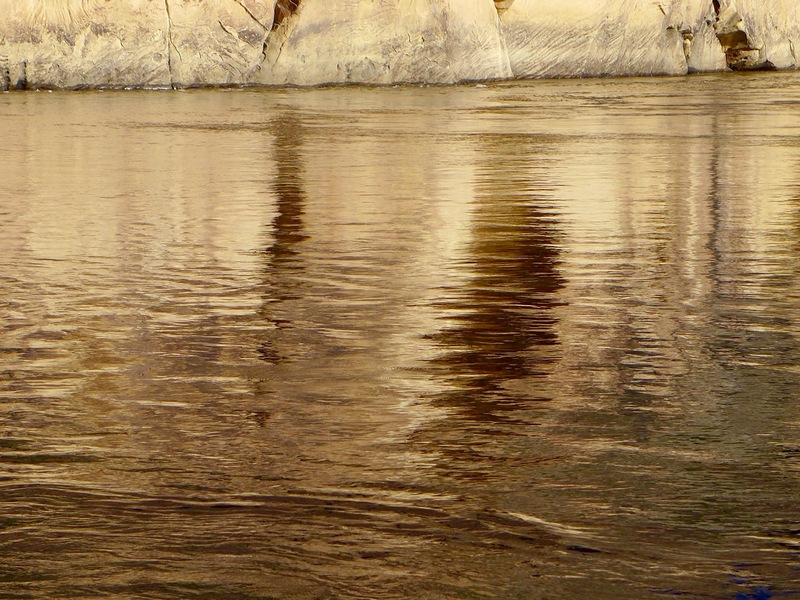 Flooding was observed in parts of Idaho, Montana, Washington and Wyoming. According to the May 29 U.S. Drought Monitor report, 26.4 percent of the contiguous U.S. was in drought, down from 28.6 percent at the beginning of May. Drought conditions improved in the Southeast and parts of the Plains. Drought conditions intensified and expanded in parts of the Southwest, interior Northwest, Southern Plains and Northern Plains. Abnormally dry conditions developed across leeward locations on the Hawaiian Islands. Above-average temperatures were observed across parts of New England and from the West Coast to the Southern Plains. Four states in the Southwest and Southern Plains had one of their 10 warmest springs on record. Across much of the East, the warm May counterbalanced the cold April, resulting in a near-average spring temperature. In the Great Plains and Midwest, the temperature jump from April to May was stark. For example, Wisconsin had its coldest April on record, followed by its second warmest May, with a month-to-month temperature increase of 28.6°F. The year-to-date has been marked by large swings in temperatures, particularly from the Great Plains to East Coast. 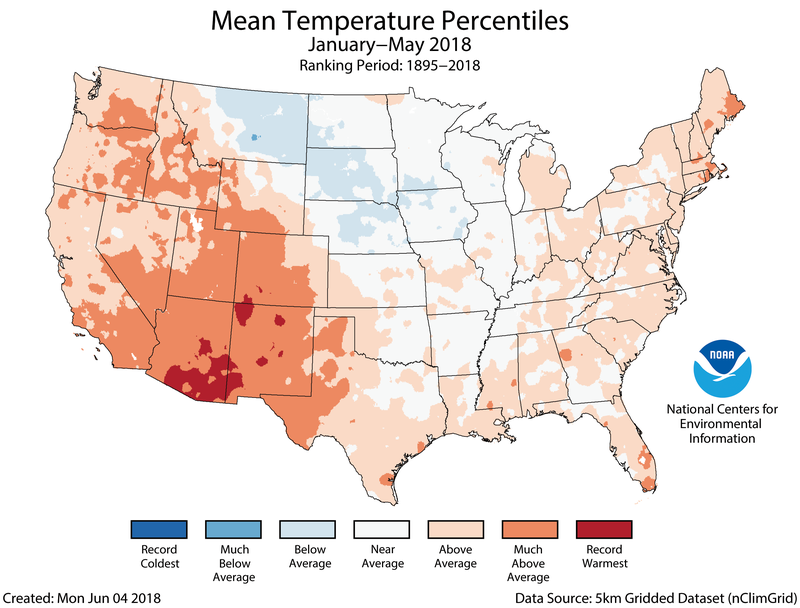 When averaged for the first five months of the year, much of the West, Southern Plains and East Coast were warmer than average. Eight states had a year-to-date temperature that was much above average. Near- to below-average temperatures were observed across the Northern and Central Plains and Midwest. The Alaska year-to-date temperature was 20.7°F, 4.9°F above average, ranking as the ninth warmest on record. Much-above-average temperatures were observed across western and northern Alaska with record warmth along parts of the Aleutians. The record low sea ice for parts of the year in the Bering and Chukchi seas likely contributed to the Alaskan warmth. Southern parts of Alaska had a near-average year-to-date temperature. 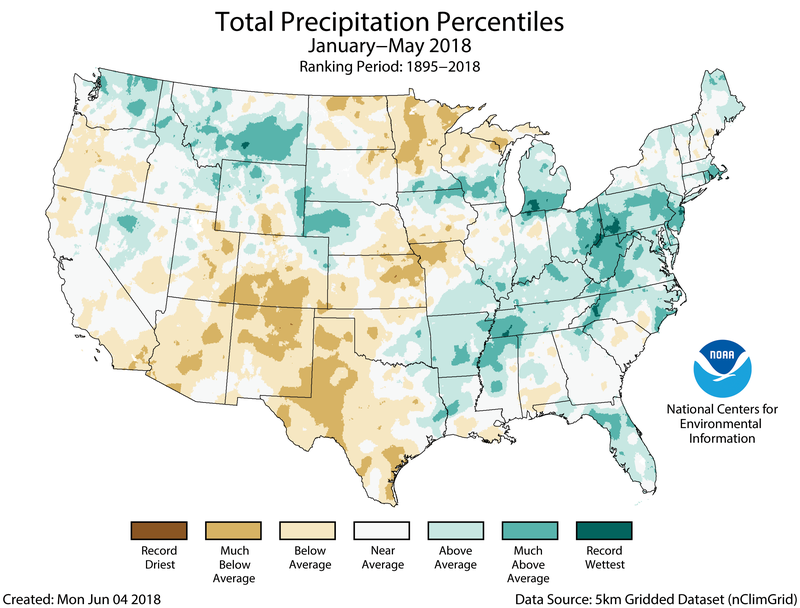 Much of the eastern U.S. was wetter than average for the first five months of the year, with much-above-average precipitation across parts of the Midwest, Mid-Atlantic and Northeast. Pennsylvania, New Jersey, Rhode Island and West Virginia each had a top ten wet January-May. Above-average precipitation was also observed across parts of the Northern Rockies and Plains, which fell mostly as snow earlier in 2018. Below-average precipitation was observed across much of the Southwest, Great Plains and Upper Midwest. This month’s State of the Climate report includes an annual update of the state of coastal high tide flooding. This type of flooding occurs when water levels measured at NOAA tide gauges exceed heights based on national flooding thresholds released in February by NOAA’s Center for Operational Oceanographic Products and Services. During the 2017 meteorological year (May 2017-April 2018), the U.S. average number of high tide flooding days was the highest measured at 98 NOAA tide gauges. More than a quarter of the coastal locations tied or broke their individual records for high tide flood days. Additional information is available in the 2017 High Tide Flooding Report. Enjoy, “Standing in the rain in Durango,” (Guy Clark) link via Jonathan Thompson. If you are concerned with the lack of action on the environment make sure to put Mother Nature at the top of your list of issues in the primary election.